In his latest guest-essay for Gates of Vienna, the British author Paul Weston addresses the current state of British politics in the face of Geert Wilders’ banishment from the country. Mr Vaz, an immigrant of Yemeni/Portuguese extraction, is clearly proud of the part he has played in restricting the ancient and bloodstained freedoms of Britain. No doubt Vaz is pleased the dark days of 1990 are now behind him, when he wrote to the Guardian to claim “there is no such thing as absolute freedom of speech“ as he attempted to ban the publication of Salman Rushdie’s The Satanic Verses. Unfortunately for Vaz, freedom of speech actually existed in 1990 and Rushdie’s book was duly published. 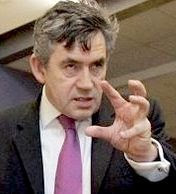 Unfortunately for the rest of us, the subversion of British law carried out by Vaz and his ilk means it no longer exists in 2009 — witness the Wilders travesty — which rather damns Gordon Brown’s apparently admirable speech as typical socialist spin, if not deliberately disingenuous propaganda. This leads to all sorts of questions. The first surely being the blind assumption of community harmony; the second asking which part of the allegedly harmonious community is threatened by the mere presence of Mr Wilders; the third wondering if “therefore public security” is just a more inclusive way of saying “therefore Muslim violence” whilst the not inconsequential fourth and final question can only be — is it actually legal? Taking one at a time, let us look first at Britain’s harmonious community. British-born Muslims make an estimated four hundred thousand trips a year to Pakistan, where as many as thirty threats against Britain are being monitored at any given time. MI5 is struggling to keep track of them all, quite understandably, as is the newly formed UK Border Agency (motto: we are closed on weekends and bank holidays), so it is obvious that those who wish to destroy us can flit in and out of terrorist training camps in Pakistan to, say, the House of Lords in London, at the drop of a hat. Despite the oft repeated insistence by British politicians that Islam is a peaceful religion, vast sums of money are thrown at Muslims in the UK in an attempt to stop them blowing the rest of us up. In 2007 “communities” Minister Hazel Blears earmarked fifty million pounds to invest in “cohesion promotion and tackling community tensions.” Ah, those good old harmonious community tensions. Blears bent over backwards as she sprayed money at Muslim “experts” stating: “Nobody has a duty to assimilate themselves but I do think we need to understand how each other lives” prompting the bearded experts, who recognise fear, defeat and dhimmitude when they smell it, to swiftly trouser the money whilst opining it would do little good as Muslims are instinctively suspicious of any help from the British government, what with them being the infidel and all that. In its overarching desire to be geographically inclusive, my government does not limit its financial largesse to the British mainland alone. When Gordon Brown visited Pakistan recently, he handed over a cheque for six million quid to promote love and peace, whilst the British Foreign Office — who once sent gunboats to troublesome countries — has bankrolled a series of TV adverts for broadcast in Pakistan in which famous Muslim personalities implore those who wish to colonise and convert us to cease forthwith, and to understand and respect us instead. We dhimmi Brits can even look forward to a constructive debate “on the compatibility of liberal and Muslim values.” I know, I know, it sounds like something out of the Richard Littlejohn school of “you couldn’t make it up” but I am at a total loss for words here. One can only imagine how constructive the debate would remain if the liberal debatee attempted to date the Muslim debatee’s sister, or even better, attempted to roger the Muslim himself. So I think we can safely say there is little or no community harmony in Britain. In terms of who should feel threatened, it is unlikely to be any of Lord Ahmed’s 10,000 band of brothers, or any other member of Britain’s Muslim community, come to that. It is something of a giveaway really, look to the man surrounded by bodyguards with a price on his infidel head, Mr Geert Wilders himself, the lone surviving Dutchman of outspoken anti-Islamic sentiment. And what of Public Security? A giveaway again. The British government did not really believe that Wilders was going to strip to the waist and engage in fisticuffs with his Allahu Akbar-ing adversaries. They know as well as the rest of us that a day in the House of Lords is more likely to consist of G&T’s with ice and a slice, than GBH with malice aforethought. I don’t really believe that Mr Wilders, a European parliamentarian, was planning on bringing his gang, or posse, to the House of Lords intent on bashing anyone who shows him “disrespect” unlike Lord Ahmed, the implausible new leader of Britain’s Muslim Street. Was the banning of Geert Wilders legal? The law used was written specifically to counter Islamic terrorism, rather than countering a man warning us of Islamic terrorism. But as with most recent laws, many of which originate in Brussels, they are vague and catch-all in their character, and deliberately so, in order they may be used against anyone the government disapproves of. “We understand the content of the film Fitna to consist of the written words of Islam alone, the spoken words of Islam alone and the physical actions of Islam alone. “Sections of these written and spoken words are in direct contravention of British and European laws pursuant to the incitement of racial or religious hatred. “We appreciate that Mr Wilders is an elected European politician who does not possess a criminal record and is therefore entitled to visit any EU country he so wishes. “We appreciate that Mr Wilders has never called for violence against the Muslim community and that even if faced with violence would seek lawful protection rather than unlawful retaliation. “We acknowledge the threats of violence that would impinge upon the public security of Great Britain have come not from Mr Wilders, but from an unelected Muslim peer, Lord Ahmed. “We tacitly acknowledge that allowing Mr Wilders the opportunity to argue that Islam is an inherently violent and intolerant faith will cause 10,000 violent and intolerant Muslims to take to the streets of London. “We appreciate that bending British democracy in the face of Muslim threats will have dangerous and far-reaching consequences. So, when does Britain explode? Tomorrow? Next year? Five years from now? I think it is some years, but the anger is building. Simon Heffer has an article in today’s Daily Telegraph talking of middle class riots. The comments are quite an eye-opener. The Daily Mail has a story today about a hezbollah chap coming to Britain – will he get a visa etc. Again, the comments are angry. If the links do not work (I am pretty much computer illiterate) go to the online paper, especially Heffer’s article. Excellent work, Paul. Did you read Trevor Kavanagh's column in The Sun on this subject? Actually it should read as follows. Threaten the status quo of community harmony among Liberal MPs and elites and therefore threaten their jobs, power and overall well being. Read it just now. Kavanagh gets stuck in doesn't he! I always think the comments are more interesting. I wonder if nasty little apparatchiks report back to the governemt on what the proles are thinking. Another warning from a "right wing extremist"... nobody will listen to this "paranoid rant"... Churchill was talking more or less like Wilders and when history will prove him right, people will finally start and listen. Until then, you better shut up. Churchill became prime minister, I doubt that a man like Wilders will ever become PM in a Western European country any soon now. "Can I help you cut my throat?" New U.K. / EU-nuch motto. I think that not-so-great Britain needs a French style revolution to happen. That country is what happens when you let idiots into public offices. When that country starts crashing their government will just hop onto their private jets and shoot on over to amerika. Thats why they don't care what happens to their home soil. For chrissake, Profitbeard, you Philistine, how many times do I have to tell you, it is "MAY I help you...?" "Can" is improper and impolite. I'll return with more helpful hints as soon as I sharpen your knife. Actually, costin, there is an outside chance Mr. Wilders could become PM or, at least, be named to a cabinet post. In polls, his party has leapt from about 15% voter approval to about 25% in just the past two weeks. What a hoot, that an almost-certainly-convicted "hater" might one day be the First Kafir of the gloriously multicultural Netherlands.